Princeton native Cynthia Baker, a CTFA/CASL for Northwestern Mutual, The Office of Art Blick at 731 Alexander Road in Princeton, was recently honored by the Princeton Regional Chamber of Commerce with a Champion for Business Award. 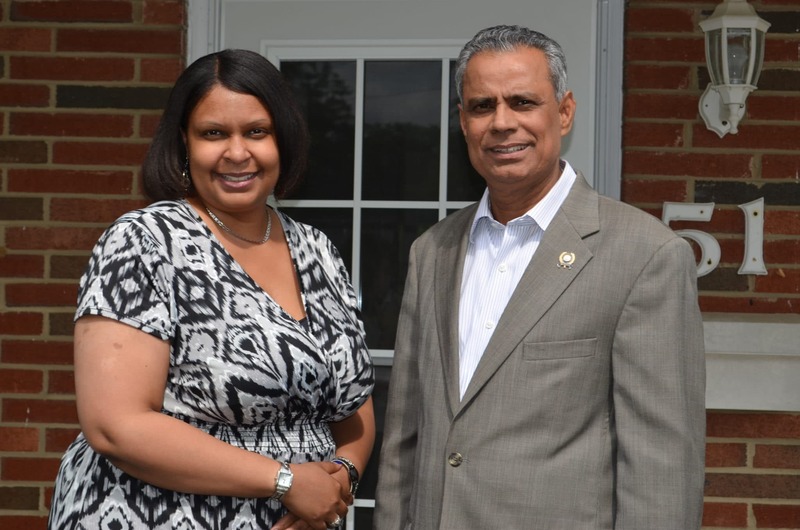 Ms. Baker graduated from the Rider University School of Business, and started her career at Princeton Bank and Trust as the assistant to the divisional president of the trust department. She has held the titles of trust officer, assistant vice president, vice president, and manager of trust and estate departments of various banking institutions throughout her career. She joined Art Blick and Northwestern Mutual in 2007 as the liaison between the Princeton Office and the Northwestern Mutual Wealth Management Company, a limited purpose federal savings bank serving the corporate fiduciary needs of the company’s clients throughout the country. 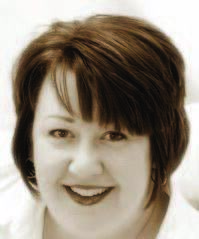 Her primary goal is to develop and administer new trust, investment, and insurance relationships. In addition to coordinating and participating in various community events, she serves as a member and Past President of the Mercer County Estate Planning Council. She is a member of the Community Options Business Advisory Board, and an Executive Officer of the Rider Women’s Leadership Council. She also chairs the Princeton Regional Chamber of Commerce Membership Committee and serves on the Independent Business Alliance planning committee. 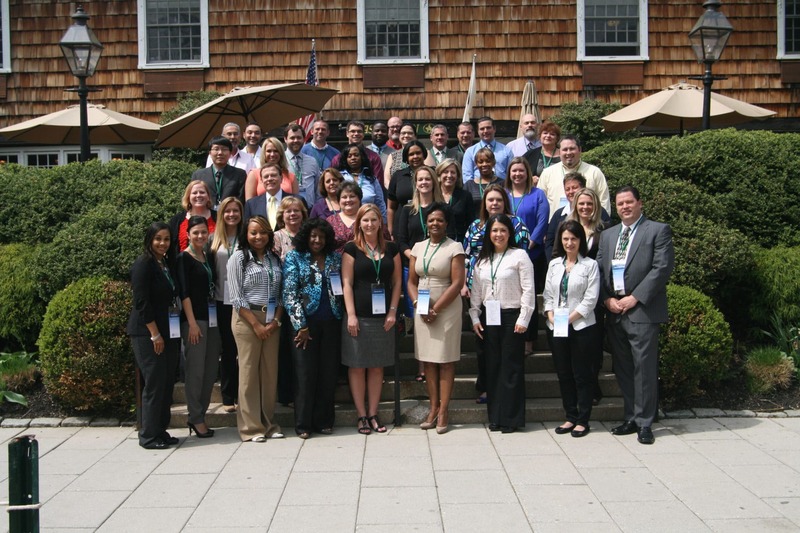 May, 2014 – Some key Community Options’ staff members from across the country pose for a photo at the 8th annual iMatter Conference in Princeton, NJ. 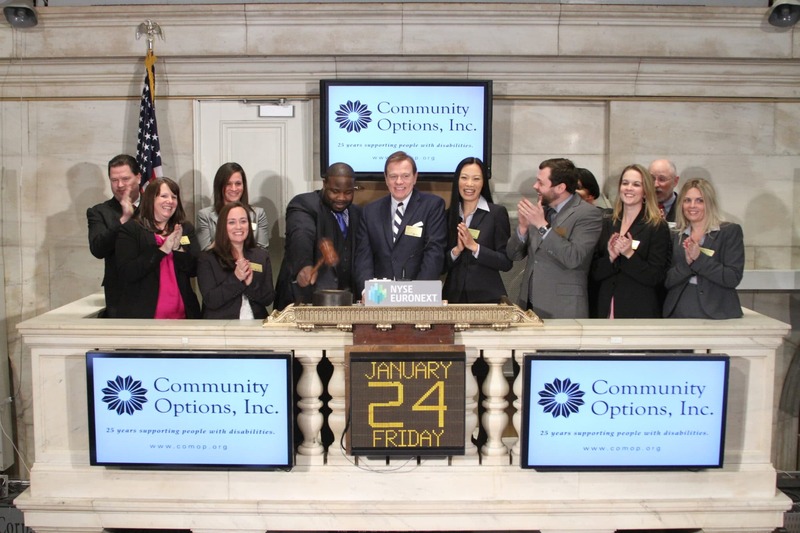 Community Options, Inc. has always taken strategic steps to improving the quality of programs and services they offer, through the training and development of its 3300+ employees. By providing opportunities for the professional development of its staff, COI is building its pipeline of future leaders, which will be able to effectively continue to carry forth the mission of the organization: empowering people with disabilities. It is a forward thinking approach to workforce planning and talent management that is not too often found in non-profits, hence the significance of the training and development program here at Community Options, Inc.
Community Options raises the bar in the human services sector through its commitment to developing high performing staff that create high quality programs and services. 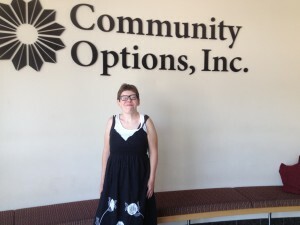 Adrienne Atchison transitioned from the Denton State Supported Living Center in April 2009 into Community Options’ Residential Support Services in Dallas, Texas. Community Options immediately addressed many issues that Adrienne dealt with on a daily basis that kept her from living a life of choice. This provided her the opportunity to be in the community, volunteer and work. One amazing change in Adrienne’s life came with the implementation of Physical Therapy supports. When Adrienne transitioned out of the State Center into Community Options supports, she relied heavily on the use of her wheelchair. We could tell very quickly that Adrienne had the ability to walk again. Through intense Physical Therapy support with highly-trained and supportive Community Support Staff, she now is able to walk on her own. The Dallas operation helped Adrienne address several behavioral and communication issues. With these supports in place, Adrienne has thrived not only in her home, but has made tremendous strides in her community. Adrienne expressed her desire to volunteer in the community. She started volunteering at Presbyterian Hospital of Dallas in March of 2010. She worked in Admissions and made packets, rolled silverware in the kitchen and sent out mail. She also assisted the Medical Staffing department and the Volunteer Services department. She volunteered more than 1,000 hours of service at the Hospital until 2013, when other volunteer opportunities presented themselves. She currently volunteers at the Food Bank and the Methodism Breadbasket. When she is not volunteering, she is the receptionist at our Dallas office. She answers the phones, checks the mail and makes referral packets. Adrienne has worked hard and accomplished so much in the past five years. Her will and desire to succeed is infectious and she is loved, counted on and respected by her peers, friends and co-workers. 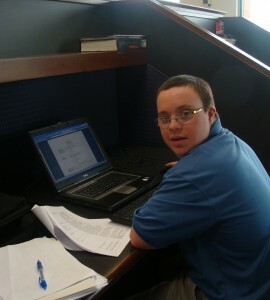 Chris, a STEP Participant, working on his resume. School is right around the corner. Many of us are buying new lunch boxes, back-to-school clothes and planning for that long wait at the bus stop as we send our loved ones off to learn and socialize. It is both an exciting and challenging time for any parent. We all want the best for our son or daughter. We want them to finish school and find a great job. As they grow up, we help them with homework and when they hit their very early teens, we push for a summer job. Some of our children work during the summer earning extra money. As they become older, some of us push our friends to find an internship. There are both paid and unpaid internships. The most valuable aspect of an internship is the experience. Internships give students the opportunity to really learn what the world of work is all about and to sharpen skills necessary to interact with others in the workplace. Learning, if they like the particular elements of the profession, enables the student to ascertain if they want to pursue a particular career or move in another direction. At Community Options, we offer year-round internships to students in their final year of high school, college and graduate school. We have MSWs available to oversee those pursuing their undergraduate degree. Everyone is welcome and all encouraged to apply. Please visit our website for more information. We also have a wonderful program called STEP, (School to Employment Program). This enables students with disabilities to pursue their profession as interns with support from our Community Options’ staff. Community Options has partnered with more than 30 local businesses to provide hands on, real world internship experiences for young adults with disabilities. Whether you want a career in physical therapy or in a law firm, in retail or in entertainment, STEP has a connection to give you the experience that will help you find the career that makes you happy. STEP has proven to be the perfect precursor to employment, having placed over 80% of its graduates into careers of their choice upon graduation. For more information on our STEP program, please visit our website transitionschooltowork.org. 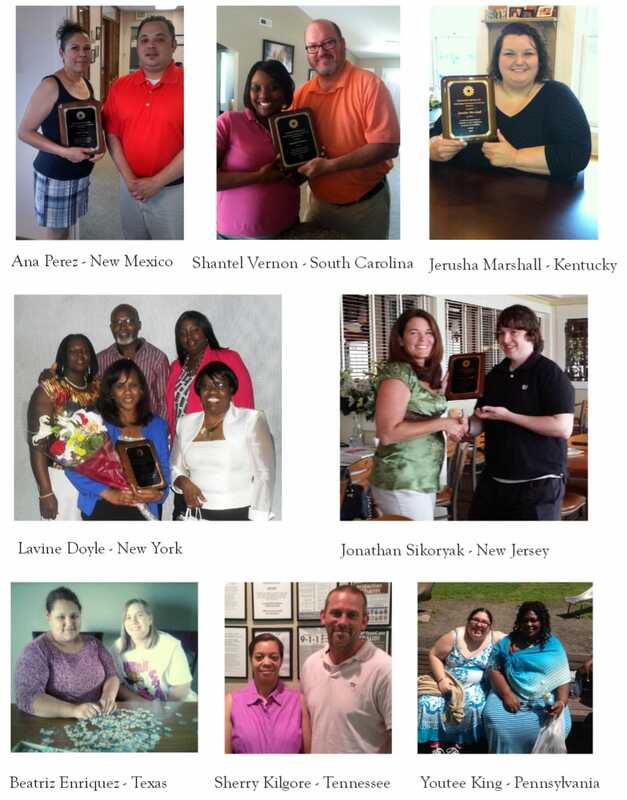 Left to right, top to bottom; Ana Perez – New Mexico, Shantel Vernon – South Carolina, Jerusha Marshall – Kentucky, Lavine Doyle – New York, Jonathan Sikoryak – New Jersey, Beatriz Enriquez – Texas, Sherry Kilgore – Tennessee, Youtee King – Pennsylvania. Community Options is proud to recognize Direct Support Professionals for improving the quality of life for individuals with disabilities. For the third consecutive year, the organization requested employee nominations for the Direct Support Professional of the Year Award. One employee from each state and a national winner were chosen for this prestigious award. Pictured below are the winners for each state, and the national winner, Alex James. Featured in photo is long time board member, Peter Dulligan, Region Vice President of TN, SC & KY, Karen Hensley and Mr. Alex James. 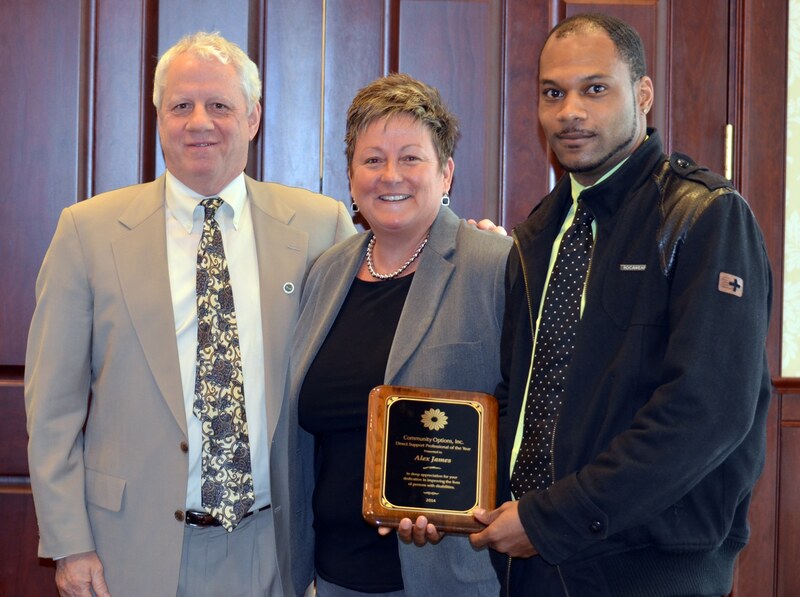 Please join us in congratulating Mr. Alex James as Community Options’ National Direct Support Professional of the Year! Mr. James is a Direct Support Professional in our Columbia, South Carolina operation and has worn many hats over the years ranging from volunteering, assisting with transitions and relocating individuals who are transitioning from institutions, and as “Master Chef” at many of the Community Options events. Job well done Alex and thank you for being a part of the Community Options’ family! Community Options appreciates employee referrals for open positions and recognizes how valuable this recruitment source has become for our organization. Referrals account for almost 30% of our newly hired employees. This shows not only how much we rely on referrals, but is also an indication that our workforce is committed to the mission of our organization. A few of the most noteworthy employee referrals are three employees who were named “DSP of the Year” for their state, Lavine Doyle (NY), Youtee King (PA) and Jonathan Sikoryak (NJ). Referrals are also welcome and appreciated from business partners, COBAC members, family members and other professional contacts. Community Options’ annual Cupid’s Chase 5K is officially slated for Valentine’s Day, Saturday, February 14, 2015. So before you go out on a nice romantic evening, or if you’re looking to meet that special someone, be sure to find your local Cupid’s Chase 5K!! In 2015, we will have 29 races from NY to AZ. There are several new race locations this year: Harlem, NY, Pennsauken, NJ, Trexlertown, PA, Austin, TX and Tuscon, AZ. EMPLOYEE SURVEY RESULTS ARE IN! Community Options would like to thank all employees who participated in the employee survey. We had the highest participation rate to date! We are pleased to share that 95% of employees feel they make a positive contribution to the lives of others, 90% feel their supervisor interacts with them in a professional manner and the #1 most cited word that comes to mind when thinking about CO is “Caring”. We are in the process of developing goals to address areas of improvement. Thank you for your feedback and suggestions to help make our workplace as productive and satisfying as possible. Community Options, Inc. Rings the Closing Bell at the New York Stock Exchange. David Sweeney, Community Options’ CFO; Lisa Smith, Director Training & Quality Assurance; Megan Fielder, Director of Special Events; Courtney Eidel, VP of HR and Quality Management; Chris Thompson, Executive Director of NYC; Robert Stack, President and CEO; Yihong Dou-Stack; Steve Verba, Managing Director; Maria Bowles, Executive Director for Middlesex County in New Jersey; Tracy Mendola, Executive Director for Passaic/Sussex Counties in New Jersey; Svetlana Repic-Qira, Regional Vice President of New Jersey. Community Options, Inc. invites you to our 8th Annual iMatter Conference at the Nassau Inn in Princeton, New Jersey. This year’s conference focuses on quality services provided to individuals with disabilities. The iMatter Conference will get underway on Tuesday at 6 p.m. with a welcome reception. There will be several notable speakers on May 7 and 8. Sue Swenson, Deputy Assistant Secretary for Special Education and Rehabilitative Services; Jennifer Velez, Commissioner New Jersey Department of Human Services; Michael DuHaime, Partner Mercury Public Strategy & Maggie Moran, President & CEO of M Public Affairs; John Crowley, President and CEO of Amicus will be speaking at the conference. For more information please email: lisa.smith@comop.org, or to download a form for registration, please visit: www.comop.org and click the events page. Sue Swenson is deputy assistant secretary for the U.S. Department of Education Office on Special Education and Rehabilitative Services. Swenson previously served as CEO of The Arc of the United States, as executive director of the Kennedy Foundation, and as U.S. commissioner for developmental disabilities in the Clinton administration. Swenson was educated in interdisciplinary humanities at the University of Chicago and holds an MBA from the University of Minnesota. She is the mother of an adult son who has complex disabilities. Secretary Swenson will discuss proven effective practices, as well as what is new in special education. She will walk the audience through her life as a parent of a person with significant disabilities and her various roles in government. 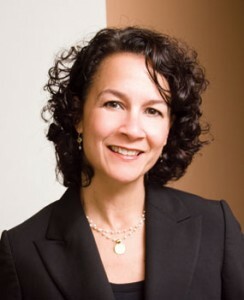 Jennifer Velez was confirmed as Commissioner of the NJ Department of Human Services in 2007; re-nominated by Governor Chris Christie and re-confirmed in March 2010. 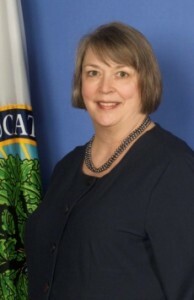 She served as one of the Department’s Deputy Commissioners from January 2006 until her nomination. DHS has the largest budget in state government, with over 15,000 employees – approximately 75-percent of them serving as direct care workers in the state-run developmental centers and psychiatric hospitals. About one in six New Jersey residents is impacted by the work of DHS. 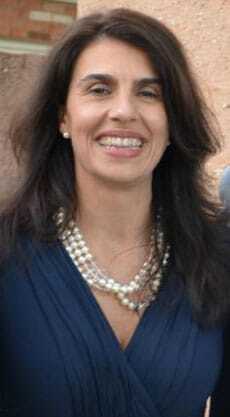 Commissioner Velez works in partnership with the Administration on initiatives including: Medicaid reform; advancing supported placement of individuals with developmental disabilities and mental illness in the community; creating employment opportunities for people with disabilities; and sustaining the safety-net of services made available for the state’s older population, and individuals and families with low income. 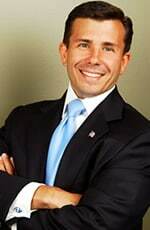 Velez was named First Assistant Child Advocate in the Office of the Child Advocate when it was created in September 2003. Previous to that role, she served as Senior Associate Counsel and Assembly Liaison in the Office of Governor’s Counsel for three Administrations. 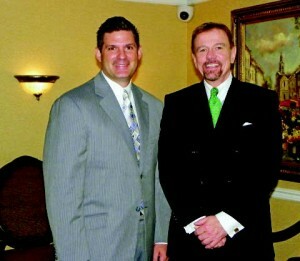 John Crowley became president and CEO of Amicus in January 2005, having served as a director since 2004. Previously he was founding president and CEO of Orexigen Therapeutics. Preceding Orexigen, Mr. Crowley was senior vice president at Genzyme Therapeutics, a position he assumed after overseeing the sale of Novazyme Pharmaceuticals to Genzyme in September 2001. Mr. Crowley was the founding president and CEO of Novazyme that was developing a novel treatment for Pompe disease. He previously served in several senior management roles with the Bristol-Myers Squibb Company (BMS), including director of the Executive Committee for the U.S. Medicines Group, director of Business Strategy for the U.S. Pharmaceuticals Group, and director of U.S. Area Marketing for the Neuroscience and Infectious Disease Division. Mr. Crowley is involved with several charitable and community organizations, including serving as president of the National Tay-Sachs and Allied Diseases Association. He is also on the Research Advisory Board of the national Muscular Dystrophy Association and the Board of Directors of St. Peter’s University Hospital. Mr. Crowley’s involvement with biotechnology stems from the 1998 diagnosis of two of his children with Pompe disease – a fatal neuromuscular disorder. Mr. Crowley and his family have been featured on the cover of The Wall Street Journal, The Today Show, CNBC and The Paula Zahn Show. The Harrison Ford movie, Extraordinary Measures is based on Crowley family’s quest to save their children. Mr. Crowley earned his B.S. degree in Foreign Service from Georgetown University’s School of Foreign Service, his J.D. 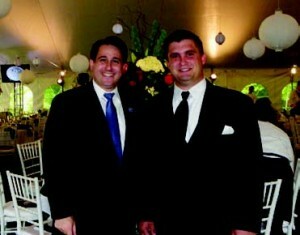 from the University of Notre Dame Law School and his M.B.A. from Harvard Business School. 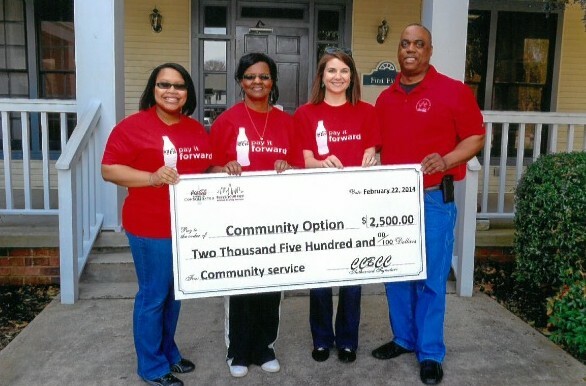 Coca Cola presented the Community Service Check to Community Options in Columbia, South Carolina. Photo includes: Dr. Sharee Smith, Dorothy Goodwin, Executive Director, Theresa Taylor, COBAC Chairperson, and Bryant Sumter, Sales Support Manager for Coca Cola. Every year, Coca Cola holds a National Day of Service to reach out and help communities in need. On February 22, the staff of Community Options’ Columbia, SC office, COBAC members along with individuals supported and their families signed up and participated in “Serve Your City Day”. Nearly 40 individuals worked together to complete a cleaning and organizing project at the Columbia office. Out of three agencies, Community Options totaled the top number of volunteers. As a result, Coca Cola awarded a $2,5000 check to COI. Bryant Sumter, Sales Support Manager for Coca Cola, presented the award. 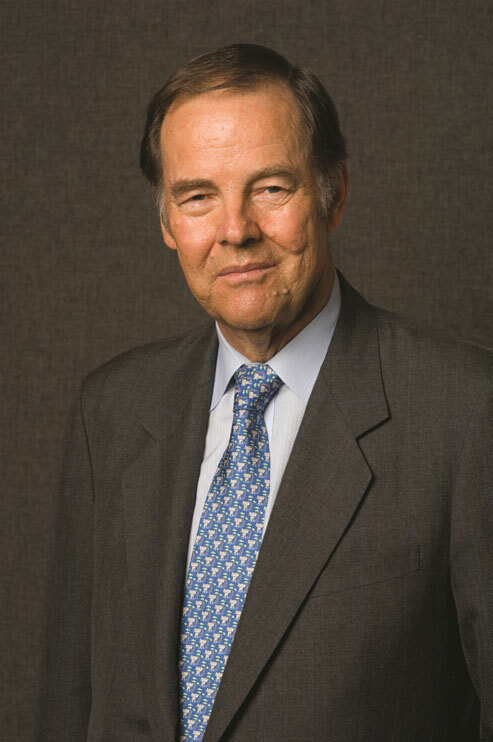 Please join us as we celebrate our 25th Anniversary honoring New Jersey’s 48th Governor Thomas H. Kean Thursday, the eighth of May two-thousand fourteen at six o’clock in the evening Morven Museum & Garden 55 Stockton Street, Princeton, New Jersey. Governor Thomas H. Kean was rated among America’s five most effective state leaders by Newsweek magazine; noted for tax cuts that spurred 750,000 new jobs; a federally replicated welfare reform program, landmark environmental policies, and over 30 education reforms. During the Governor’s tenure, many of us witnessed him signing legislation expanding the Division of Mental Retardation to support persons with Autism, Cerebral Palsy, Epilepsy, Spina Bifida, Traumatic Brain Injuries and other neurological disabilities. He created the Governor’s Office on Prevention of Mental Retardation and supported the reduction of institutional care of 8,100 people with disabilities to less than 4,200 people, thereby creating the largest development of community based supports in the history of New Jersey. Morven Museum & Garden is located in the beautiful town of Princeton, New Jersey. This former home of a signer of the Declaration of Independence also served as New Jersey’s first Governor’s Mansion. Morven is the “people’s” place: a National Historic Landmark owned by the State of New Jersey and operated by the non-profit, Historic Morven, Inc.
Community Options is delighted to celebrate its 25th year of service to people with disabilities at this historic home and is honored that such a prestigious elder statesman will celebrate with us on our silver anniversary. 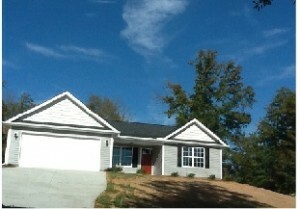 The net proceeds of these donations will be applied to the purchase of new homes. Need Mother’s Day ideas? Look no further than Vaseful – we have flowers for Mother’s Day that will suit any style and we offer Mother’s Day flower delivery nationwide! Wish her a Happy Mother’s Day with a beautiful bouquet of flowers, the perfect Mother’s Day gift! Vaseful Flowers and Gifts, a Community Options Enterprise, is a charming flower shop that offers high quality floral services and delivery to anywhere in the world. While working at Vaseful, employees with and without disabilities learn valuable retail skills such as credit card processing, dictating phone orders, retrieving and processing of orders received through our website, shipping and distribution, inventory management, and of course, floral processing and arranging. We are committed to serving our customers with the finest floral arrangements and gifts, backed by our 24-hour guarantee. 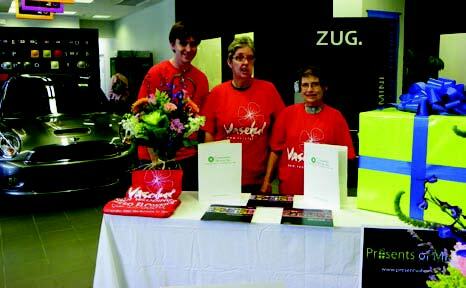 25for25 is a campaign to raise $25,000 for our 25th year anniversary. 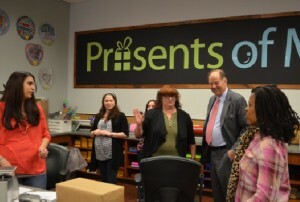 This will help support individuals with disabilities and create an employment center. Please check out the following link! We greatly appreciate your support! Why is supporting Community Options, specifically the Cupid’s Chase 5K Run, important to you? I have been involved with special education for my entire professional career and as a special educator I realize the importance of supporting individuals with disabilities beyond the school years. The Cupid’s Chase is just a way to provide financial support for activities provided during the year. On a professional level, what do you do for work and how can the work you do with the Cupid’s Chase 5K and Community Options benefit you professionally as well? I am a college professor who teaches pre-service teachers about special education and teaching persons with disabilities. I am able to provide volunteers for Cupid’s Chase as I require volunteer hours from my students as we are public servants and we need to give back to the community. This is a way to give back to our community. In any endeavor with persons with disabilities, I gain more than I ever give. It is not about me, but I guess it is part of my giving back-volunteer belief system that contributed to receiving the Professional Service Award for Faculty from TTU in May 2011. How did you become involved with Community Options? Was becoming the Cupid’s Chase 5K Chair your first introduction? I have been a long time friend with Jeffrey Moyer, the Executive Director of Community Options in CT. Jeff and I had lost touch for quite some time and when we reconnected, I discovered he was working with individuals with disabilities. He came to know that I had been becoming actively involved in races and that I had always had an interest in working with those who have disabilities. 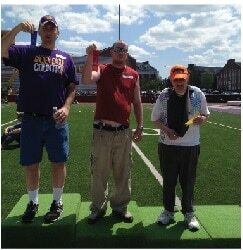 I had recently been volunteering my time with the CT Special Olympics – Winter games and looking for ways I could continue to be involved in other times of the year. Jeff approached me and asked if I would like to be a part of the race committee and of course I could not refuse. The Cupid’s Chase 5K Run is the largest, simultaneous run held by any charity in the United States. How does that make you feel to be a part of such a large movement? I am naturally drawn to large movements being that I am a community organizer. I am thrilled and excited to be part of such a great event. Last year was our first year for this event in CT and went better than we could have ever imagined. We only hope to continue to grow it bigger and bigger each year. I am a very active triathlete and will be training for a half ironman starting in November 2011 and I have a side business making cheesecake balls called Schatzi’s. They are perfectly proportioned confections. I first became involved with Community Options in 2004 as a COBAC member. In 2006 I was nominated to be President of the COBAC Board and served in that capacity until 2010. Becoming the Cupid’s Chase Chair combined my dedication to serving Individuals with Disabilities and Running. The Cupid’s Chase 5K Run is the largest, simultaneous run held by any charity in the United States. How does that make you feel to be part of such a large movement? The fact that Cupid’s Chase is touching so many communities at once is impressive. However, the underlying clear message is more important to me because it says that we support a group of individuals that have been traditionally marginalized and voiceless. This run has become a significant leader in breaking that silence. I am currently the District Manager for FoodStaff in Nashville and we have hired several individuals with disabilities to work at various job sites. This has not only filled a business need for our company and contributed to the economic well being of various employees but it has also sent a message to other employers of the value of a hiring people with disabilities. 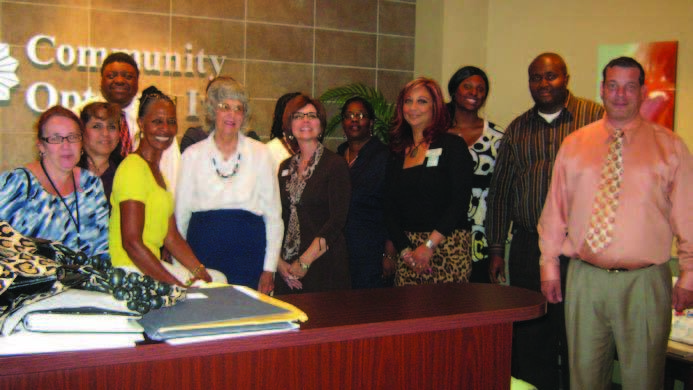 Community Options, Inc. started in South Carolina in 2007 and the Community Options Business Advisory Council was formed. I have been acting Chair of this council since its inception. I love that this organization not only provides residential support for individuals with disabilities but that they also help to provide employment support as well. I received a masters in rehabilitation counseling from the University of Tennessee and I understand how difficult it can be for this population to be served with dignity and respect- and that is just how Community Options, Inc. treats its consumers. I think supporting Cupid’s Chase is important because it not only brings attention to a population that is underserved but it also brings about awareness that we all have the ability to make a difference- whether it is running or walking the race, sponsoring the event, or even bringing about a conversation about what we, as a community, can do to help. When you visit and individual who is being served by Community Options, Inc. at their residence, you immediately know why it is an important organization to support and Cupid’s Chase is an extension of that support. It allows these programs to grow and reach more people in our community. It has been amazing to see the excitement for Cupid’s Chase grow in our community. Our race has become so large that this year we moved it to Finley Park in Downtown Columbia. Our current Governor, Nikki Haley, is our Honorary Chair. Cupid’s Chase is a fun atmosphere and brings attention to a great cause. 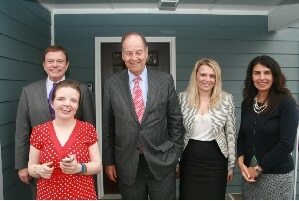 It allows us to support those in our community who are living with disabilities. This is a group that I am proud to support. the United Way of the Midlands and Central Carolina Community Foundation is dedicated to transforming our community through active and collective philanthropic investment. Women in Philanthropy is comprised of an Executive Board and 6 subcommittees. Having the opportunity to Chair the COBAC board for the past 4 years has helped me to understand what it means to be a volunteer who wants to make a difference with their time and resources. I have been able to use my skills in order to encourage our COBAC group to focus on the big picture of making a difference and changing the lives of individuals in our community. 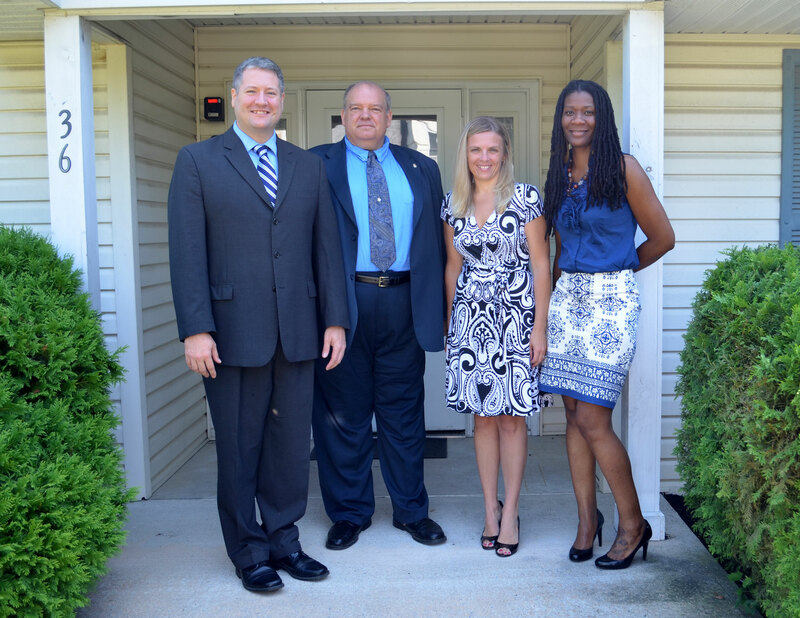 In 1991, John Pavlovsky, Jr., was approached by Community Options, a new nonprofit that was getting off the ground in Bordentown, New Jersey to attend their first business advisory council meeting. 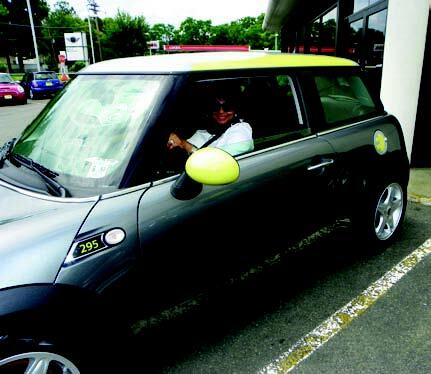 At the time, Pavlovsky was President of the Greater Bordentown Area Chamber of Commerce and was asked by Community Options to send a representative from the chamber to attend the first meeting. Pavlovsky decided to attend the meeting himself to see what the business advisory council was all about. Little did Pavlovsky know that the first Community Options Business Advisory Council (COBAC) meeting he would attend in October of 1991 would turn into twenty years of service to the organization. Shortly after that first meeting in 1991, Pavlovsky became the Chair of the Mercer County COBAC and has held this position ever since. The mission of Community Options was and still is to develop housing and employment opportunities for people with developmental disabilities. The focus of the COBAC was to recruit local business members within the community to help connect people with developmental disabilities to competitive employment. Pavlovsky wanted to be involved with Community Options because he believed in the mission of the organization and the work they were doing to improve the quality of life for people with developmental disabilities. Pavlovsky believes that there are great benefits for employers that hire people with disabilities. Pavlovsky has seen first-hand the dedication of someone he has helped to secure competitive employment and he believes with careful planning for that individual, the sky’s the limit. Pavlovsky utilizes a portion of each meeting to spotlight a person with a disability Community Options is currently working with to give them the opportunity to present to the COBAC on their skill set and the type of job they are looking to secure. This type of presentation by the person allows the council members to ask questions that are pertinent to the employer-employee connection process. It is no easy task to keep a voluntary council motivated over long periods of time; however, Pavlovsky has managed to do this for the COBAC. Pavlovsky has managed to maintain members of the Mercer County COBAC for almost ten years with the admission of new members as well. 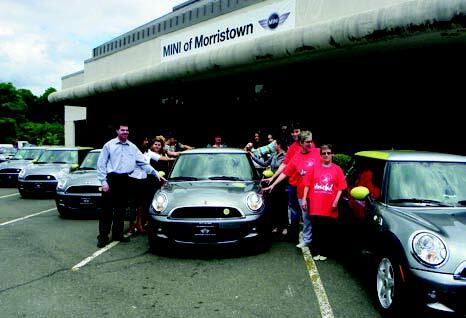 Pavlovsky believes that the Mercer County COBAC is a really good group that has a diverse skill set that is constantly working together to provide and promote opportunities for people with disabilities. Pavlovsky has high hopes for the future of the Mercer County COBAC, which includes all members participating in the organizations annual events as well as working to highlight the skill sets of people Community Options is supporting to link them to gainful, competitive employment on an on-going basis.